Real Estate market information for New Fairfield, CT provided by Olga Simoncelli, Broker/Owner of Veritas Prime Real Estate. Data is based on MLS statistics. ECONOMIC ENVIRONMENT: interest rate rise now seems to be a certainty – the Fed must show faith in the improving economy. In fact, the U.S. economic situation may be stronger than even what already positive numbers are indicating (Fed’s Plan to Go Slow Isn’t Sure Bet NYT 12/06/15). My own little indicator: a statistic I heard on a morning business report on CBS 880 as I was driving to tennis: on some recent survey 71% of those that reported “NO INCOME” also reported that they have smart phones… Interesting: there appears to be hidden money in the economy and the retail sales numbers will probably soon show that. Also – oil trading below $35 today! In other words, there may be further rate increases and sooner than anticipated. Market Volatility: All those adjustments lead to activity in the financial markets, or volatility. Higher interest rates result in lower bond yields, prompting shifts from bonds into other investment instruments, portfolio readjustments, nervous shifting, etc. Bigger Bonuses on Wall Street – activity generally means higher earnings for the Investment Banks. I sometimes refer to the Candlewood Lake area as the “Playground of the Investment Bankers”. Wall Street crowds like to spend week-ends, particularly in the summer, outside of the City, often in the Hamptons. Our picturesque hilly lake area within an easy drive of the City gets a good number of week-end and vacation home buyers from New York City. With good year-end bonuses and a positive economic mood, Candlewood Lake area homes, including those in New Fairfield, are a smart BUY opportunity as they represent good value. Some of the other charming New England towns in our area are Ridgefield, Redding, Bridgewater, Sherman, New Milford, Brookfield, Danbury, Bethel, Newtown and Southbury, to name a few. 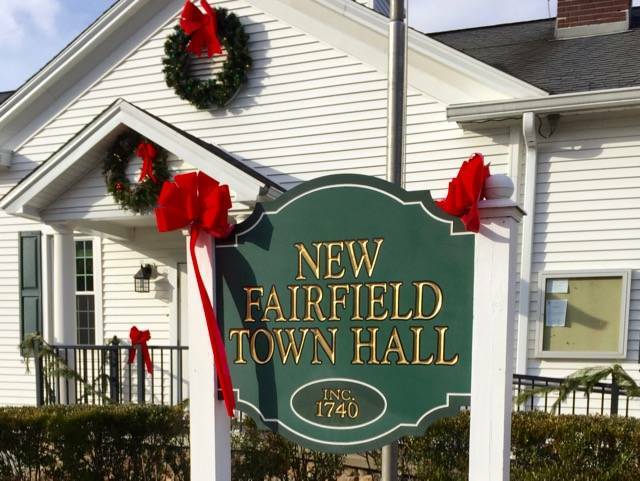 New Fairfield homes sold and average prices January 2005-November 2015, as per MLS. 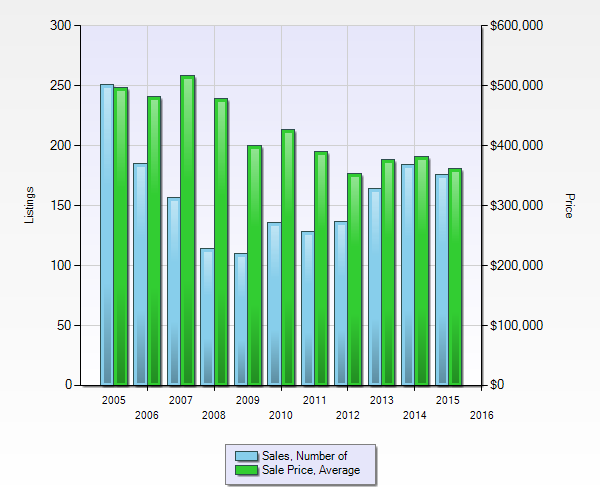 As evidenced by the green column on the graph above, the average sale prices in New Fairfield are still struggling to catch up to its banner years of nearly a decade ago and have shown some choppiness over the last few years. In this ten-year time frame, 2007 had the highest average price at $516.532; the most homes were sold in 2005 at 251. While the number of homes sold is steadily improving (if viewed over time, as shown by the blue column), the average price still seems to be trending down. Through the month of November, 2015, the average price was at $362,422 based on 176 homes sold. December numbers will bring up the number of sales totals, but the average sale price may still be lagging behind the prior year’s average, which came in at $382,082 in 2014. BUYERS – use your “spare cash” and borrowing power (interest rates are still good!) to invest in good value homes. Feel free to call to get advice on what’s best for you based on your preferences and budget. I won’t try to sell you a home. This year, the best discount rates (based on sale price to original price ratios) were offered in the months of January, February and March. Homes were sold at about 9.5% below the original asking price. Winter is a good time to buy a home, don’t wait for the “spring market”! SELLERS – now is the time to put your “best foot forward” in trying to sell your home, there shoud be buyers out there. Best thing to do is to listen to your trusted realtor as to how best to showcase your home, how to market it and how to fine-tune the price to current market conditions. They know what it takes to sell your home. Feel free to call me for advice. I don’t want your listing.